The nineteenth century was the golden era of riverboat gamblers, crooked railroad contractors, and filthy-rich medical quacks. These crooks made a living deceiving people who took a stranger at face value and left their doors unlocked. Throw in some get-rich-quick schemes and a generous mixture of whiskey and there was never a shortage of suckers. Conman George Parker was able to stay in business for forty years by “selling” public structures such as Madison Square Garden and the Statue of Liberty. He even “sold” the Brooklyn Bridge as often as twice a week. Most of the popular cons of the time were simple. Anyone with an honest face, a believable story, and a lack of morals could do quite well. For most, the Salted Gold Mine or the Magic Wallet cons were enough to satisfy their greed. However, the more ambitious grifters tried the Big Store, an illegal, underground betting parlor such as the one seen in the movie The Sting. Whatever their methods, these confidence men ushered the American West out of a time of innocence and into the Roaring Twenties. Laurence J. Yadon is an attorney, mediator, and arbitrator. He presents on various legal subjects and crime history. A number of Yadon’s ancestors participated in some of the most violent wartime incidents in Missouri and were related by marriage to the Youngers of the James-Younger gang and their first cousins the Daltons. 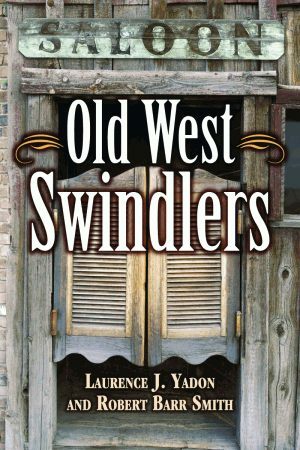 He is the coauthor of Pelican’s 100 Oklahoma Outlaws, Gangsters, and Lawmen: 1839-1939; 200 Texas Outlaws and Lawmen: 1835-1935; Ten Deadly Texans; and Arizona Gunfighters. Yadon resides in Tulsa, Oklahoma. A History Channel commentator, Robert Barr Smith is the author of more than thirty articles and five books on the American Old West. He has edited several titles on outlaws, including the four that Yadon previously coauthored for Pelican. A retired colonel, Smith served more than twenty years in the Judge Advocate General’s Corps and earned the Bronze Star and the Legion of Merit while serving in the United States Army. He is a former deputy attorney general of California and a retired professor of the University of Oklahoma College of Law. He lives in Norman, Oklahoma.